▼ Six New Costume Employees appear! 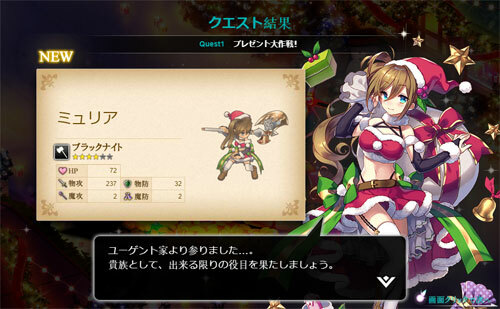 During this event, new costume employees with Christmas clothing appear! Costume employees feature brand new artwork and completely new voice lines! Furthermore, they have exclusive 3D models and skills. ※ The above 6 employees will only appear during the [Merrypani☆Starry Night Christmas Party] event and will have resume appearance rates higher than normal employees. Furthermore, using the [Limited] Christmas Postbox will increase these chances. ※ The above 6 employees can be recruited from the rewards received from the [Merrypani☆Starry Night Christmas Party]. ※ [Christmas] Cinzia Ghiglia's voice uses the same lines as the normal Cinzia Ghiglia. 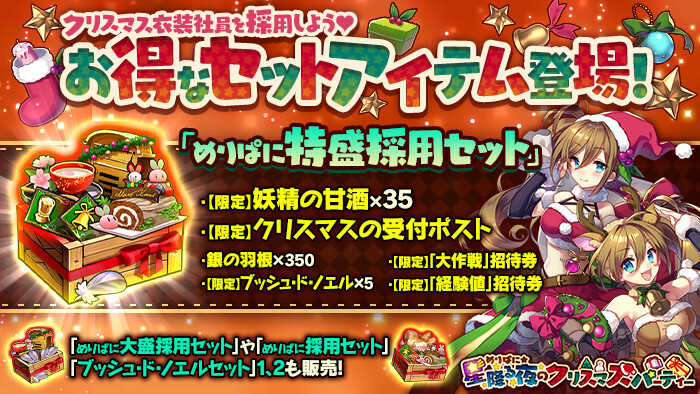 ▼ ★4 Christmas Costume Employee present! 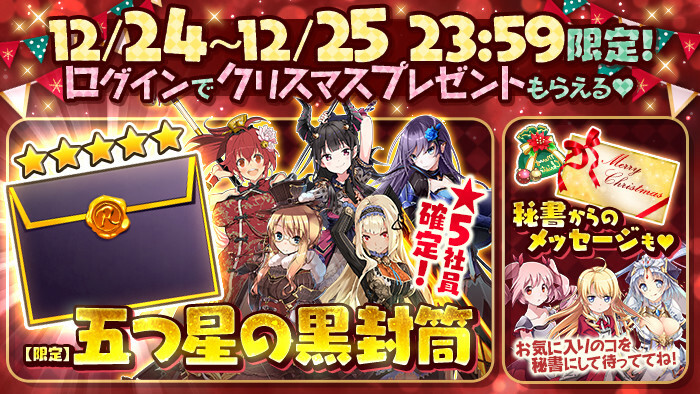 Log in during the event to receive a [Limited] ★4 Holy Night Envelope (4x) x1 as a present! 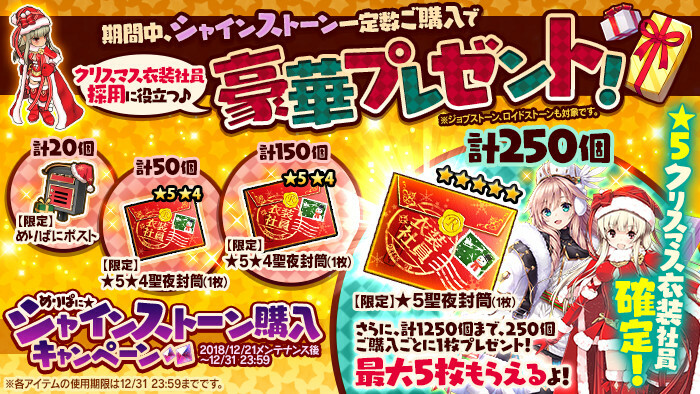 The [Limited] ★4 Holy Night Envelope (4 letters) is a special envelope that contains resumes from the costume employees [Chika], [Myucel], [Myuria], and [Alexia], and you can pick one of them! This special present can be found in your in-game mail. ▼ Collect ornaments to help the girls! 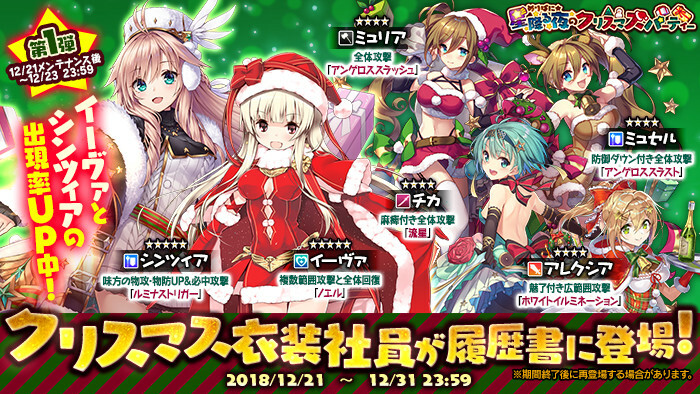 During this event, help the six girls by collecting ornaments to deliver Christmas cheer to all sorts of places. The Event Quests will drop [Limited] Ornaments which can be collected to help these girls. Visit the special event page to deliver these [Limited] Ornaments to the girls. After receiving a certain amount of [Limited] Ornaments, you will receive an item gift from the girl in return. Unlocking and reading through each girl's scenario will increase the ornaments and EXP you gain from the event quests! Eva ⇒ Chika ⇒ Aleksia ⇒ Myucel ⇒ Myuria ⇒ Cinzia. After helping Cinzia and finishing her scenario, the epilogue scenario will unlock. An Event Quest where you can collect [Limited] Ornaments, EXP, etc. Use the [Urgent] [Great Plan] Invitation Ticket to unlock the quest for 30 minutes. Drops a large amount of [Limited] Ornaments. [Limited] Buche de Noel (Yule Log Cakes) can also appear as a rare drop. [Limited] Candy Cane can also appear as a rare drop. 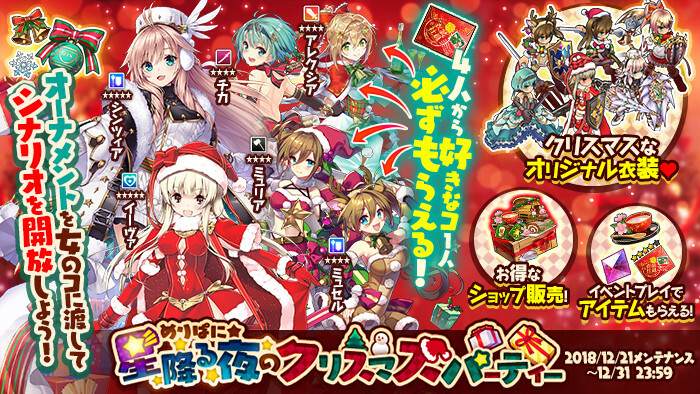 ▼ Collect Ornaments more easily with Christmas Costume Employee Exclusive Weapons and Event Accessories! Using the following items in the event quest will lead you to a route where you can collect more Ornaments. Having more employees in your party with +4 accessories equipped will further increase the chance to lead to more Ornaments. 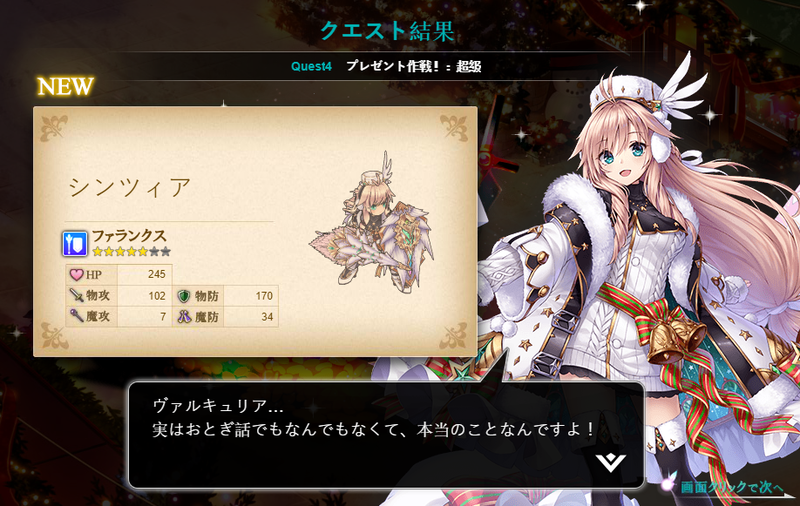 ※ Equipment can be crafted from the limited recipe received from the gift rewards and Character Stories. ※ Only affects the event quest [Holy Night Present Plan!] Beginner Rank to Ultra Rank. Does not affect [Urgent Quests]. These Urgent Quests can help you collect large amounts of [Limited] Ornaments or large amounts of EXP. They will expire 24 hours after they are distributed and must be used before then. ▼ Christmas Log-in and Secretary Message! [Limited] Holy Night Envelope (1x)? Unlocks the [Great Present Plan!] Quest for 30 minutes when used, where you can collect large amounts of Ornaments. Expires 24 hours after the distribution time. Please check the distribution times for more details. This event will conclude on 12/31 (Mon) at 23:59. [Limited] items will expire on 12/31 (Mon) at 23:59. 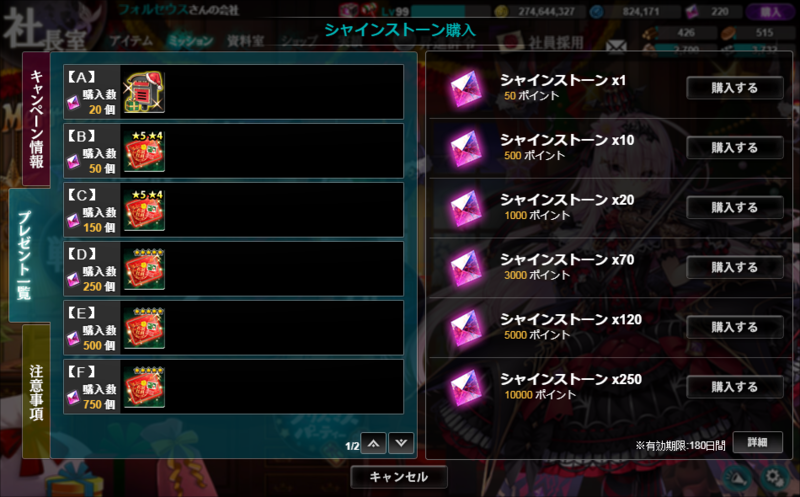 The special event page item [Limited] Ornament and certain event items will no longer be available after 12/31 (Mon) at 23:59. There is a chance this event will appear again in the future. Last edited by Folseus; 12-31-2018 at 03:11 AM. Well I feel dumb, but where is the event and event character equipment recipes? Btw, there is any item boosting exp? ...why they still don't have a way to reread the festival card...accidentally getting the card from damaged form Ito have lost all my drive to capture all the 5* cards.